Staff Surgeon William Mackenzie Skues qualified MB from Marischal College, University of Aberdeen in 1853. He was commissioned Assistant Surgeon in the Army Medical Department on 29 July 1853. In 1865 – 1866, he was Principal Medical Officer in the Expedition from Aden into Arabia against the Arabs. He published a case of Tetanus treated with extract of Indian herbs with recovery in the Edinburgh Medical Journal dated April 1858. 29 July 1853 Staff Assistant Surgeon. 1853 – 1855 Served in Sierra Leone and Gambia. 2 Nov 1855 Appointed Assistant Surgeon Royal Newfoundland Companies from the Staff vice Assistant Surgeon Gilbert William Spence who resigned his commission. The Royal Newfoundland Companies were a British garrison unit of veterans stationed in St John's, Newfoundland from 1824 to 1862. In 1862, they were absorbed into the Royal Canadian Rifle Regiment. 2 Oct 1857 Married Margaret Ayre at St Thomas Anglican Church, St John's Newfoundland. 13 Aug 1858 Had a son George Edward Mackenzie Skues at St John's Newfoundland. 21 Sep 1860 Appointed Staff Assistant Surgeon. 1862 – 1864 In Bombay. 8 July 1862 Promoted Staff Surgeon vice Staff Surgeon Joshua Henry Porter who became Surgeon 89th Foot on 24 June 1862. The vacancy on the Staff was filled by the recall from half-pay of Staff Assistant Surgeon Augustus Robinson Hall. 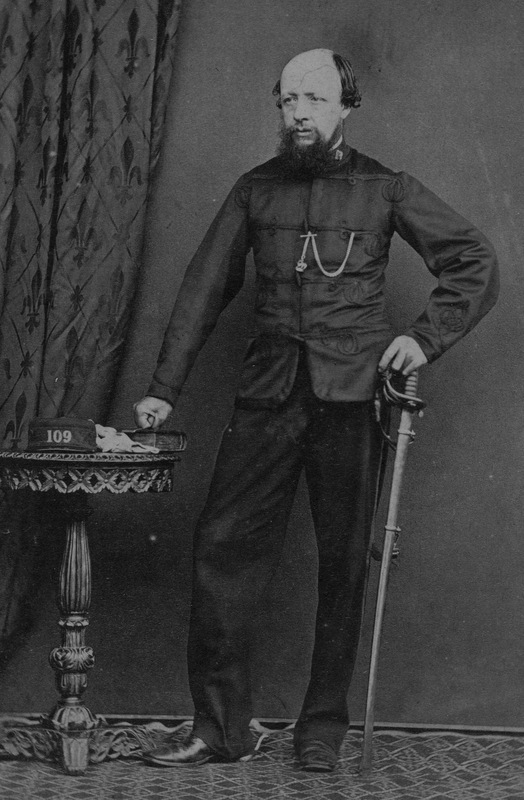 28 June 1864 Surgeon 109th (Bombay Infantry) Regiment. 23 July 1870 Exchanged with Staff Surgeon Robert Thornton who moved from the Staff to 109th Foot. 1870 – 1875 In Malta. Malta 19 Sept 1870 Arrived from England on appointment. Relieved Surgeon Major George Cuninghame Meikleham. Took charge of Forrest Hospital St Julians. Detachments of infantry occupied the barracks and huts at Pembroke Camp for the annual instruction in musketry from 1 January to 3 March, and from 5 October to 31 December 1870. The sick from the Camp were admitted to Forrest Hospital (Spinola Palace) St Julians. Between 5 October and 31 December 1870, Forrest Hospital was under medical charge of Staff Surgeon William Mackenzie Skues. Malta 1 Jan 1871 On duty at Forrest Hospital St Julian's. Malta 1 May 1871 Moved to the Military Hospital Valletta. Malta 1 Aug 1871 On duty at Valletta. Malta 1872 On duty at Citta Vecchia Sanatorium. Malta 29 July 1873 Promoted Surgeon Major. Malta 29 Aug 1874 To England on leave. Malta 29 Oct 1874 Returned from leave. Malta 28 Oct 1875 Left for England. 1876 – 1878 In Jersey. 1878 – 1881 In Bombay. 2 Dec 1881 Retired with the honorary rank of Brigade Surgeon. 10 June 1892 Died at Nunhead, aged 64 years. Drew R., 1968. Entry No: 5160. Medical Officers in the British Army 1660 – 1960. Volume I: 1660 – 1898. London: Wellcome Historical Medical Library. TNA:CO 158/228, Returns of the General and Staff officers of the hospitals attached to the Forces in Malta (Aug–Dec 1871). Naval and Military Medical Services. Br Med J (1892); 1: 1332 (Published 18 June 1892).